Speaking at a conference for human resource management for Railways, Railway Minister Suresh Prabhu suggested ways in which Indian Railways could improve. 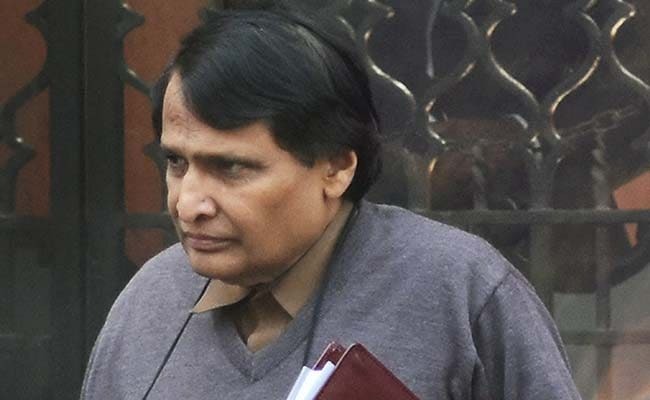 New Delhi: Railway minister Suresh Prabhu today advocated for a system of reward and punishment for railwaymen depending on the performance. He also suggested incorporating changes at the top-level to begin with which can be percolated down to the grassroots level to achieve better results. "There should be reward for those who do well. We have to introduce it in the system. How to bring better performance to the fore and also recognise the same and those who do not perform well how to punish them," he said at a roundtable conference on human resource management of railways. Railways has a large workforce of 13 lakh people spanning 17 zones and 68 divisions across the country. "For example, if we are executing a project and somebody completes the project in a record time then the team implementing the project should be rewarded. Similarly if a person delays it and causes loss to the organisation, he should be penalised," Mr Prabhu said. Describing the railways as a "unique organisation", the minister said profit was possible in the railways but it could not be achieved while meeting the social obligations. Highlighting the need for changes in the organisation he said, "A change can happen in railways when we realise where are the shortcomings. We must understand where do we stand." He also said the railways, as an organisation, must revisit and re-look itself to know whether it was on the right track and gear up for future. He said the railways should become competitive and profitable while shouldering social responsibility. Focusing on changes, Mr Prabhu asked, "Where the change should begin with? Should we start at the bottom or from the top? Whether it should start with the track-man or the top man in railways?" He said, however, that the starting point should be the officers themselves. "If an organisation has to change, the change must begin at the top level and only then everybody will follow." Emphasising the role of divisions in railway functioning, he said, "It is at the division level where the cutting edge of customer service happens. Division is the one where maximum action took place. Our divisions are focal points of the operation." He also termed the railways as the most "strategic asset" of the country. "All our coaches are requisitioned for the movement of troops. Whether reaching our soldiers at the border and making trade and commerce in the run, dispatching water to water- starved region, railways is needed." Referring to the public transporter's goals, he said, "Our corporate goals are to be efficient, modern, tech-savy, financially better off and pro-people." Stressing that the corporate goals of the railways were "well defined", he said, "Now we need to find out whether our organisation is capable of meeting those goals." The railway minister further said it was important to find out how the goals should be attained, while suggesting that having "right people" in the organisation and keeping them at "right place" could be a step toward this.